Situated in the quiet hamlet of Rhyd, this traditional stone holiday cottage is ideally located to explore both the mountain and coastal attractions of Snowdonia. Ty Uchaf has two bedrooms, sleeping up to four guests, and is set in a stunning location in the Vale of Ffestiniog, with the backdrop of the Moelwyn mountains. Forest and hill walks are available from the front door of the cottage, and the Ffestiniog Railway runs close by (Tan-y-Bwlch station is a 15 minute walk from the cottage). 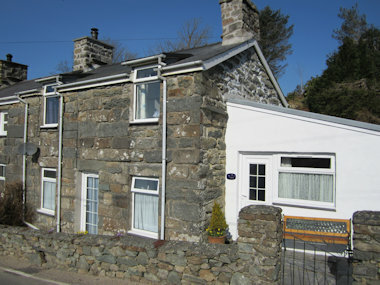 •	Located 5 miles from Porthmadog, 7 miles from Beddgelert, and 3.5 miles from Penrhyndeudraeth. •	Good pubs and a village store are within 2 miles or 5 minutes’ drive. •	The cottage has been extensively upgraded and renovated in the last two years. •	Two bedrooms (one double, second bedroom with two single beds). •	Heating by night storage and panel heaters, with a log burner in the lounge. •	Well equipped with free WiFi, satellite TV/DVD, music centre with i-pod docking, DAB radio, washing machine, microwave oven, electric clothes dryer. •	Maps, guide books, games and DVDs available for guest use. 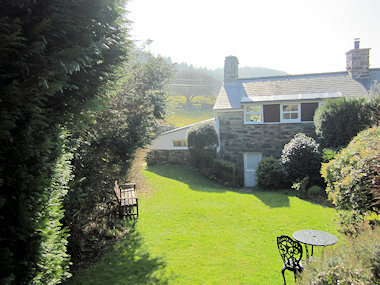 •	Secluded rear garden with views to the Moelwyn mountains. •	One pet dog allowed by prior arrangement. •	All bed linen and towels are provided. •	Electricity and a limited supply of logs are included in the rental price. •	Parking is available in a parking bay 50 yards from the cottage. •	Saturday changeover is preferred, but we can be flexible depending on dates/availability. •	Not suitable for disabled guests or very young children – cottage is non-smoking.